“CHRISTMAS IN MALIBU”…NOW A CERTIFIED CULT CLASSIC! After helping to sell ONE BILLION records in the industry, Joe Klein’s “CHRISTMAS IN MALIBU ” by The Rad Dudes has truly become a cult classic….20 years after first being released! I’m proud to introduce you to my friend and former client, Joe Klein, multiple Clio and International Broadcast Award winner, who wrote and produced over a thousand radio spots back in the 70’s and 80’s promoting albums for Donna Summer, The Village People, Parliament, George Clinton, Devo, The Doobie Brothers, Van Halen, U2, Kenny Rogers, David Bowie, Kim Carnes, Sheena Easton, George Thorogood, J. Geils Band, Tina Turner, Bob Seeger, The Steve Miller Band, Tina Turner, The Plasmatics, The Vapors, The Commodores, Lionel Richie, Huey Lewis and the News, Eddie Rabbit, Leo Sayer, Christopher Cross, Joan Jett and scores of other chart-topping acts. As president of Los Angeles based production company L.A. Trax, Inc., Joe was considered one of the best promo producers in the business, and his campaigns helped to sell over one billion records, cassettes and CDs. In doing so, he really did help to raise the bar on how records were promoted in general. Joe began his career as a teenage disc jockey, then moved on to recording engineer and producer. He produced hundreds of commercials and jingles in the seventies with a partner named John LaSalle, a renowned singer and jazz musician originally from New York City. He was also a record producer, whose credits include my album on Casablanca and a co-production with Scott Shannon on an album by The Sunset Bombers, a late seventies punk rock band which featured Doug Feiger (The Knack), Brandon Mathieson (The Rubber City Rebels) and Rick Armaund (1999). Christmas In Malibu had its beginnings as a surprise yuletide hit of the 1988 holiday season. The song came to me as a musical epiphany of sorts while sitting on Malibu beach over the summer several months earlier. The story of how it got recorded and ended up on hundreds of radio stations, MTV, VH-1, Friday Night Videos and even the NBC Nightly News that first year really is quite wild. The song and video continued to air for several more years and then pretty much faded from view by the mid-nineties. Back in 2005, I decided to post the song online and, to my surprise, Christmas In Malibu started getting played on dozens of podcasts. In 2006, I made a distribution deal with a company called IODA to distribute the song as a download worldwide, and then posted the video on YouTube and a view other video sites. That year the song spread to many more podcasts and even started getting played on the radio again. By last year, Christmas In Malibu was getting mentioned and embedded in hundreds of blog posts and the video was listed on dozens more viral video sites. This year, on its twentieth anniversary, Christmas In Malibu seems to have taken on a life of its own and achieved a kind of “cult classic” statis within the new media community. The track and video are popping up virtually everywhere. This past week the video even made the front page of Mevio, the online new media network (formerly known as Podshow) launched in 2005 by former MTV veejay Adam Curry and Ron Bloom. On the front page video promo for what was new on the network, Adam remarked how he remembered the video had been a “huge hit” on MTV back in the day! I posted the whole story of the making of Christmas In Malibu on my company’s website, and you can read it here. Now check out 99 CHRISTMAS MUSIC VIDEOS featuring the NEW MILEY CYRUS, Aretha, Nat “King”Cole, Bing, Elvis, EXCLUSIVE JOSH GROBAN FROM NOEL, NEW ALVIN AND THE CHIPMUNKS, “A Charlie Brown Christmas”, Paul Evans, Jingle Cats, ALAN O’DAY, Neil Diamond, Band-Aid, EXCLUSIVE UNEDITED CHRIS BROWN “THIS CHRISTMAS”, Enya, Carpenters, NEW JULIANNE HOUGH, Brenda Lee, Beach Boys, NEW ARCHIES, Sponge Bob, Perry Como, and so much more! HOURS AND HOURS OF FAMILY FUN with the original Christmas music clips and new Christmas Video animations! You can find it here. Tags: "Christmas In Malibu", 99 Christmas music videos, Adam Curry, Cult Classic "Christmas In Malibu", HOLIDAY MUSIC VIDEOS, Joe Klein radio spot maker, Joe Klein Scott Shannon co-produce Sunset Bombers, Mevio.com, RAD DUDES "CHRISTMAS IN MALIBU"
THE STORY BEHIND THE MOTOWN CHRISTMAS ALBUM! “It’s summer of 1973 and Ed Silvers, President of Warner Brothers Music, is losing his patience with me. He thinks I’m spending far too much time trying to get our songs cut at Motown. Although I secure songs in our catalog by some of their biggest artists, they’re only album cuts. Ed is convinced that I’ll never get a single released by Motown. I know at this point that the only way I could have a chance for a hit and escape the wrath of Ed, is to get a cover by the Jackson 5 or little Michael. There was only one staff writer at Warner Brothers music who could write in a classic R+B style, George Clinton, Jr. I call George, who knows nothing about any of this as soon as I get back to my office. He can’t believe I told them we’d have a finished song to them by Monday, when it’s Friday and we haven’t even started. Saturday morning we meet at my office. It’s the middle of summer, about 90 degrees, but we have to get in a Christmas Mood. As I tell George about my break up with Diana last Christmas, then I start to throw Ivory Snowflakes around the room. Soon, we have the first verse and chorus. On Monday morning George does a piano voice demo, and I get it to Jerry and Mel that afternoon. They love it so much that they knock one of their own songs off the date and cut ours the next day. THE TOP, THE BEST, AND THE GREATEST MICHAEL JACKSON VIDEOS!..FOR FREE! P.S. CLICK HERE FOR A FREE LAST MINUTE GIF IDEA! “NEW CHRISTMAS MUSIC VIDEOS 2008 for FREE”! includes Miley Cyrus, The Jonas Brothers, ARETHA, ELVIS PRESLEY DUET WITH MARTINA MCBRIDE, NEW “ARCHIE’S CHRISTMAS PARTY”, Alan O’Day “I HEAR VOICES”, Tony Bennett, PAUL EVANS‘ “SANTA’S GOT STUCK UP IN A CHIMINEY”, Faith Hill, U2, THE RAD DUDES “CHRISTMAS IN MALIBU”, Rascal Flatts, DAVID ARCHULETTA “OH, HOLY NIGHT”, and MUCH, MUCH MORE! Elvis and Martina duet , Miley, JONAS BROTHERS, Taylor Swift, David Archuletta , ARETHA, U2, Alan O’Day, THE ARCHIES, Paul Evans, Rascal Flatts, NEW MUPPETS, and MORE! JUST ADDED! “Santa’s Got Stuck Up In A Chimney”, just this side of a million views on YouTube, by ’60s singer/songwriter Paul Evans (“Roses Are Red”, “7 Little Girls Sittin’ In The Backseat”), is approaching territory reserved for Rudolf The Rednosed Reindeer, and Frosty The Snowman”! What they’re calling the Christmas novelty of the year is turning into the comeback of the millineum! YOU SAY YOU WANT MORE? Then click onto THE STORY BEHIND THE MOTOWN CHRISTMAS ALBUM…the classic album that almost never saw the light of day. Diana Ross, The Miracles, The Supremes, The Temptations, The Jackson Five, Stevie Wonder, and Michael Jackson all contributed to one of the greatest Christmas albums of all time, THE MOTOWN CHRISTMAS ALBUM. It is also the story of how George Clinton, Jr. and I wrote “Little Christmas Tree” for Michael Jackson. Read all about it here. If you liked “NEW CHRISTMAS MUSIC VIDEOS 2009”, please feel free to share it with a friend…but if you loved it, please feel free to send it to your entire address book! MERRY CHRISTMAS…ENJOY TO THE WORLD! From Artie Wayne On The Web, Whoppy and Streaker on the couch. They’re all here, JUSTIN BIEBER, Taylor Swift, MICHAEL JACKSON, REINDEER SINGING “WHITE CHRISTMAS”, Nat “King”Cole, Bing, NEW ARCHIES, Elvis, Rudolf, JOSH GROBAN FROM NOEL!, Neil Diamond, Band-Aid, “THIS CHRISTMAS”, NEW ALVIN AND THE CHIPMUNKS, ALAN O’DAY, Jingle Cats, Carpenters, NEW JULLIANNE HOUGH, Brenda Lee, PAUL EVANS, Tony Orlando and Dawn and so much more! HOURS AND HOURS OF FAMILY FUN with the original Christmas music clips and new Christmas Video animations! She smiles back and says she shouldn’t be doing this…and takes me into the room where he did his writing. This is the instrument, I read about in Life Magazine. Berlin, with no formal training, was only able to play in the key of C. So he had this upright piano made with a “gear shift”, to change keys or modulate with a flick of the wrist! Although I want to sit and play, I don’t want to overstep my bounds, so I just gently and respectfully touched it on my way out. ORIGINAL CLIP! Elvis from his 1968 special singing, “Blue Christmas”. 10 years later, I told Toni Wine (”Candida”,”Groovy Kind Of Love”) I told her the story…and showed her some lyrics I had written that fateful night, “I Lose it When I Hear “White Christmas”. She loved it, but wanted to make the story more universal. Over two writing sessions, which we started on Irving Berlin’s piano, that was given to Toni many years ago, we came up with…. Then click onto THE STORY BEHIND THE MOTOWN CHRISTMAS ALBUM…the classic album that almost never saw the light of day. Diana Ross, The Miracles, The Supremes, The Temptations, The Jackson Five, Stevie Wonder, and Michael Jackson all contributed to one of the greatest Christmas albums of all time, THE MOTOWNCHRISTMAS ALBUM. It is also the story of how George Clinton, Jr. and I wrote “Little Christmas Tree” for Michael Jackson. Read all about it here. If you liked WHOPPY AND STREAKER”S 99 CHRISTMAS MUSIC VIDEOS, please feel free to share it with a friend…but if you loved it, please feel free to send it to your entire address book! MERRY CHRISTMAS, HAPPY HANUKKAH, HAPPY KWANZA…ENJOY TO THE WORLD! 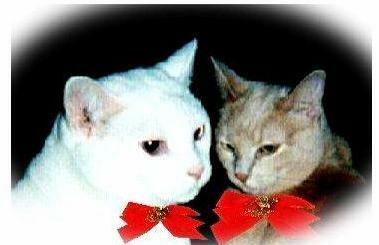 Special thanks to Barry Oslander for Whoppy and Streaker’s Christmas bows.